One of yoga’s (many) beauties is it can literally be done anywhere. And nature enhances your practice in an entirely different way than a studio does. Nature connects us to our roots and you need to root down before you rise up. 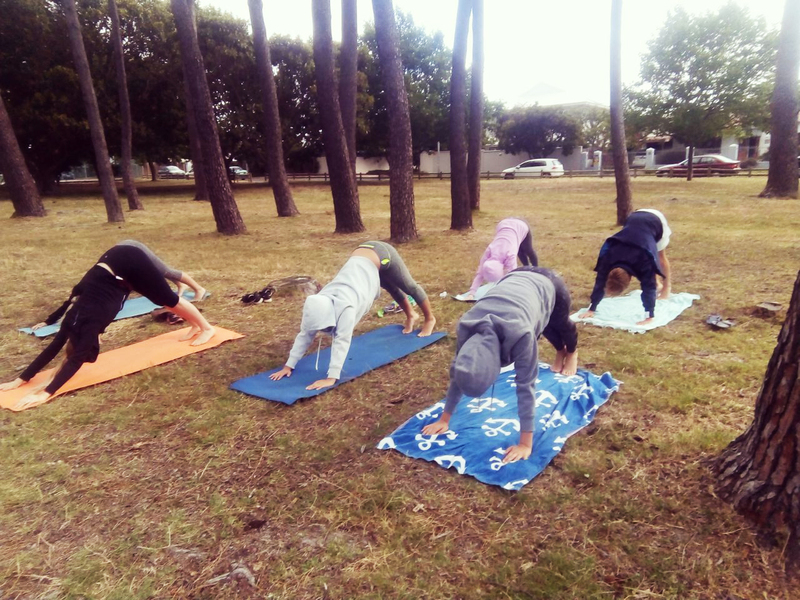 Outdoor yoga is a wonderful way to re-root! A big part of yoga and meditation is grounding. It’s important to get in touch with yourself, connect with nature and get grounded. Just imagine lying in savasana with just your mat separating you from the earth – you’ll feel more grounded than ever! Spending time outside actually gives us more energy! Studies have shown that being outside sends signals to the brain that the body is back in its native environment, which in turn triggers the senses to stay alert. Being outdoors heightens our senses, making it an enchanting experience. 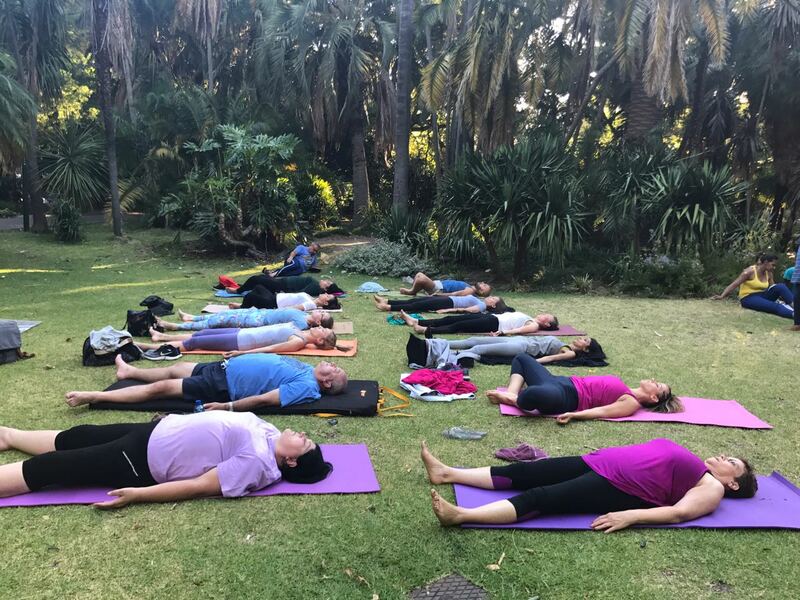 Fresh air elevates our breath awareness making it easier to be self-aware in terms of our breathing – and we all know how important breathing is. Just being outdoors can alleviate stress… now imagine combining it with your yoga practice?! Buddha wasn’t in the meditation hall; he was outside, in the forest. Time to OM outside! Transitioning from the indoor yoga studio to the floating kayak or paddleboard can also reignite a welcome state of playfulness that sometimes has gone dormant in our adult lives. Nature connection diminishes our level of disturbance and increases our sphere of awareness drawing us closer to our inner selves. All levels welcome to all classes. Please arrive 10 minutes early to register and to avoid disrupting the class once it is underway. Remember your mat/towel. Pay with cash or SnapScan on the day. You will find us setup on the second lawn after the SA National Library. Join us for an invigorating vinyasa class. Find us in the beautiful Century City Oval. Join us for an invigorating vinyasa class. You will find us setup next to the blue sculpture, just off the promenade. Opposite the Dolphin Inn Guest House - 75 Beach Road. You will find us down the stairs to the left, near the big boulder. Look out for the flag. 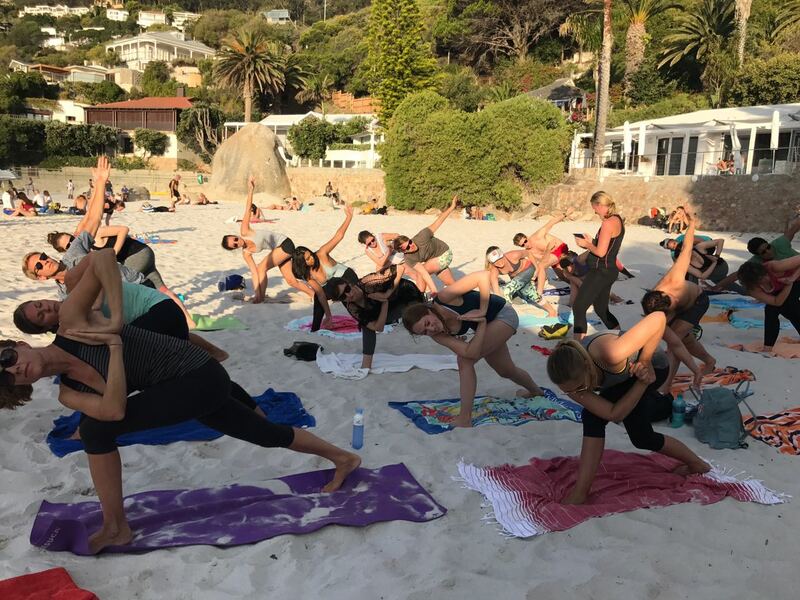 Join us for some beach yoga. BREATHE IT ALL IN AND LOVE IT ALL OUT!